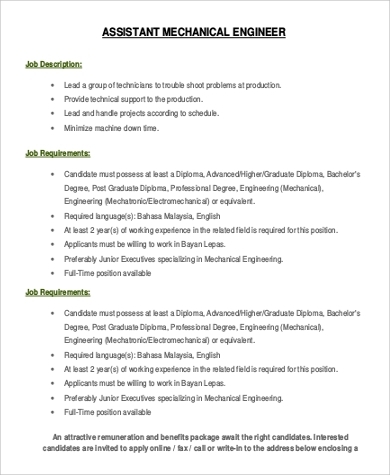 Are you an aspiring assistant engineer? Do you want to become an assistant engineer? If your answer is yes to both of these questions, then you have come to the right place! An assistant engineer is known to perform a wider range of sightly difficult tasks. 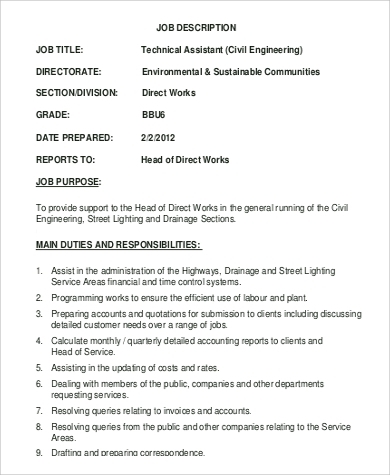 Assistant engineers are also more familiar with the regulations as well as the city projects. 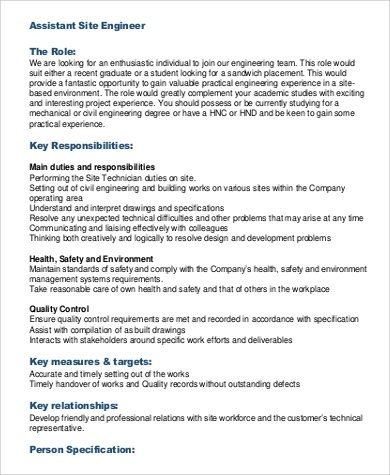 Perhaps you might want to have a look at of these Job Description Samples that you might find useful as well as helpful with regards to the subject matter. It can also help you give more information as well as a variety of different perspectives on a career of assistant engineer position. 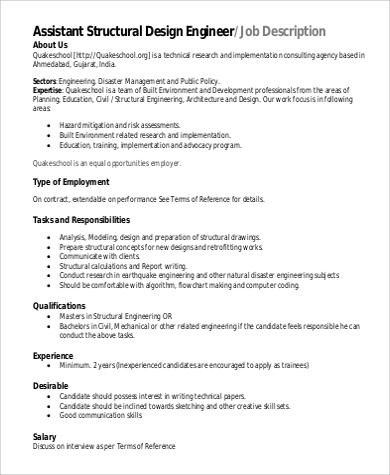 You can also check out this page’s examples of Systems Engineer Job Descriptions as well as examples of Quality Assurance Job Description, which can definitely give you suffice insights as well as provide you with a variety of perspectives in relation to the resume samples, project engineer job descriptions, and the like. 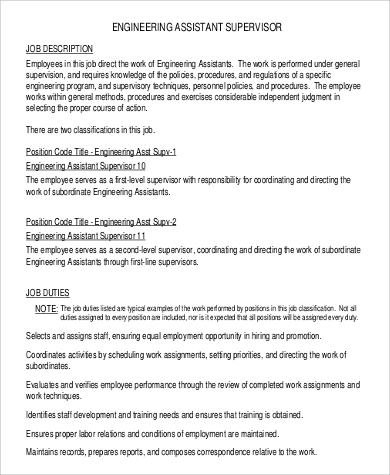 As distinguished by the Associate Engineer based on the performance of the mundane routine duties and tasks that are assigned to positions, an assistant engineer is an entry-level class in the professional engineer series. Oversees and supervises the inspection of construction projects as well as to make sure that the construction project complies with the specifications and the appropriate plans. Estimates as well as prepares the estimates for the construction projects. Performs layout work as well as planning with inclusions of the field survey for the maintenance projects as well as the construction project. 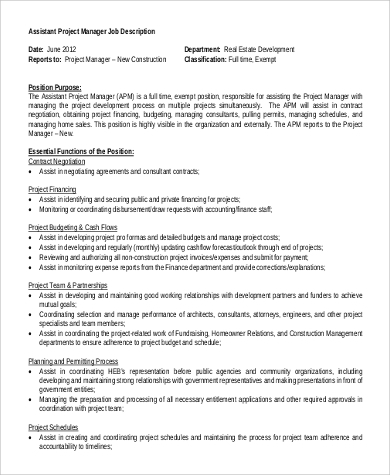 Expected to perform public relations with the public and also with the contractors. Carrying, lifting, keeping or storing records on designated storage areas that are usually only authorized for the engineers. The willingness to run office errands picking up computer as well as office supplies, drop off mail, equipment, arrange for shipping parts and the like either by driving or on foot. 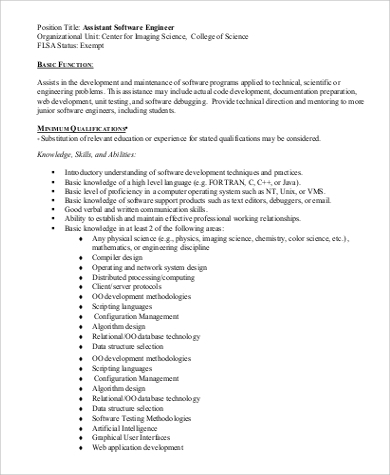 Ability to work with workstations as well as personal computers to be able to do spreadsheets, word processing as well as the ability of utilizing appropriate engineering software applications. This would also include the understanding of computer file management as its usage is essential and important. Capable of following and understanding complex written as well as verbal instructions from the manager or from the supervisory staff. 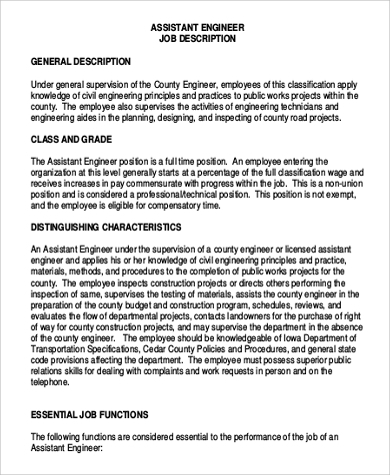 Is the Assistant Engineer Career Position for You? 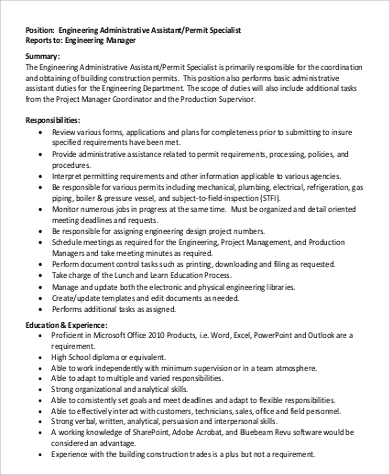 Furthermore, you can also check out this page’s example of Process Engineer Job Description, which you may find useful as well equally helpful with regards to the subject matter.